Little Man was so exited to get to decorate this great waste free (and recyclable) lunch box! Goodbyn is a small company in Seattle who had a little idea to reinvent the way kids eat lunch—making lunchtime easier, more inspiring and fun for both kids and parents. From the beginning, we decided to be as transparent as possible about our decisions as a company: how we produce, ship and get product to market. Below, you’ll find information about our materials, suppliers, vendors and craftsmen whose unrelenting energy has made Goodbyn possible. Each Goodbyn lunchbox comes with a drink bottle and set of two sticker sheets! Select your purchases below by typing in the quantities desired, then click 'add to cart' to proceed. Tanya Peila and Goodbyn are giving away a Goodbyn Lunchbox! 5. Follow Goodbyn on Twitter. I would love to win because this seems like a super fun lunch box to own. I'm not real complicated in that aspect! I really love that the company is so honest and open about their manufacturing process. Most of all, I LOVE that the product is MADE IN THE USA and it is recyclable! It is always better, in my opinion, to spend your money with companies who are interested in honesty, integrity, and keeping jobs in the USA. Seems simple, but sometimes companies like these are really hard to find these days. Great product find! Excellent giveaway! I am also loving these BTS giveaways! Thanks so much for hosting these for your readers. 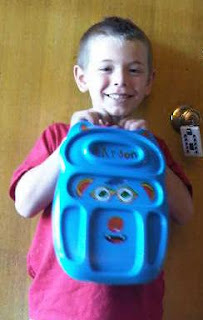 I want to win so my daughter's face will light up as much as your son's did in that picture over a new lunchbox!! !